The Newport 561-GBM Blank, Grin Lens Mount is just that- a blank, ready for you to machine to mount your own Gradient Index lens for mounting. There is a dimple premachined to center the lens and match it to the other Newport 561 ULTRAlign series items, but the uses for mounting your items are limited only to your imagination. 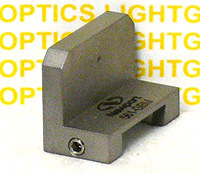 The bottom is premachined with a dovetail to mount on the Newport 561/561 ULTRAlign positioners. The locking setscrew is also there.